Our pure shea butter has been cleaned and filtered for your pleasure and safety. We don't use any chemicals or alcohols in any of our products. We keep it natural for you. Use our unscented shea butter to even your skin tone, to avoid stretch marks during pregnancy, for chapped lips, eczema, scars, burns, blemishes, dark spots, wrinkles, and irritation of mild psoriasis. 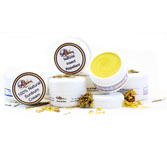 Try our scented shea butter. It comes in: (Mango & Coconut, Lavender & Vanilla, Lemongrass & Sage, Lavender, and our signature scent Abike which is a soft earthy aroma with wood undertones). All of our scents are delicious! We also have an excellent Foot Butter to keep your tired achy feet refreshed. Shea butter melts at body temperature to keep your skin soft, hydrated and healthy. Now all you need is a masseur / masseuse! That part is on you. We'll provide the shea butter! Take a look at what our customers have to say about our natural products.